South Africa safari destinations are legion. How can you choose the South African safari that is going to provide the most value for you in terms of wildlife and service? Well, one of the ways that works best, especially for wildlife spotting, is to ask someone who has already been there on safari what they saw and experienced. That's an excellent way to find out what it might be like if you decide to go on your own South Africa safari. These people have heard the sounds of lion and hyena calling in the dusk and seen the crystal clarity of an African night sky. 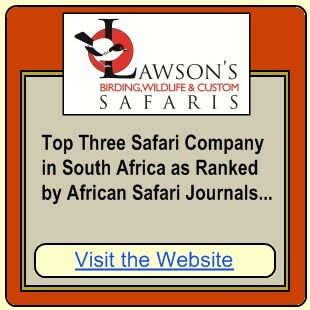 They can tell you exactly what a South Africa safari is like and very importantly, it's independent and unbiased advice. It might prove difficult for you to track down someone who has gone on a south African safari, so I have done it for you. I've listed the South Africa safari journals below according to the areas in which they took place. South Africa has a wide variety of wildlife experiences to choose from. This national park (satellite map and distance/time calculator) covers an area the size of Wales (380km/236miles long and 60km/37miles wide) and contains a variety of wildlife that is unrivalled anywhere else in Africa. There are over 147 species of mammal to be discovered here and 517 different bird varieties. The road and accommodation infrastructure is particularly good here too as this is arguably the best managed African national park. It's widely ranked as one of the top safari destinations on the continent. Third trip with Bearded Heron » This "once in a lifetime experience" was so good we already had 3 safaris with this company, of which 2 in a span of 7 months. We saw giraffes sparring, a herd of over 500 Buffalo, a giant of an elephant submerging totally in the water with only his trunk visible.. 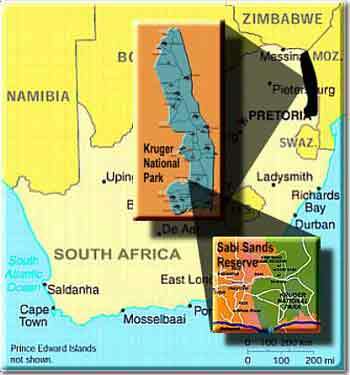 The privately owned Sabi Sands Game Reserve shares an unfenced boundary with the Kruger Park which means the animals can move across the border at will and it contains about 30 up-market South Africa safari luxury lodges. Off-road driving is permitted here which enhances the wildlife viewing experience because it's possible to follow the animal once the tracker has found it instead of being limited to only going where the road takes you. This enables these lodges to specialise in finding the normally very elusive leopard so your chances of seeing this beautiful cat on a safari here is much higher than normal. Timbavati Private Nature Reserve is an area adjacent to the Kruger National Park, consisting of a number of private land blocks that is set aside for conservation and wildlife tourism. Off-road game viewing ensures you can view animals up close and they also have a rule that no more than two vehicles are allowed at a sighting at any one time. Ecotourism is high on the agenda at Ngala, with WWF and South African National Parks in conservation partnership with the private owners. The reserve is bordered in the east by the famous Kruger National Park, and on all other sides (almost surrounded) by Timbavati Private Game Reserve. "Ngala" means lion in Shangaan, the local culture and language, so be sure to look out for some of the resident prides when going on a South Africa safari here. In the northwest corner of the country is this national park with arid landscapes and red sand dunes, resulting in remarkable sunsets. Game includes gemsbok, springbok, huge black-maned lions, cheetah, leopard and a good concentration of a raptors. 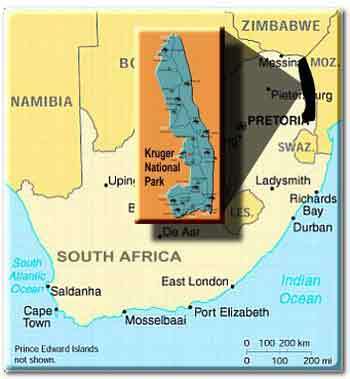 This detailed Kgalagadi Transfrontier Park map and distance calculator will help you orientate yourself in the park. Among the hills, rivers and pans of one of the oldest reserves in Africa you'll find a wide variety of game and birds as well as a strong Zulu history, elements for the perfect South Africa safari. The location of the park offers an additional advantage: it is around the corner from the Greater St Lucia Wetland Park - a UNESCO World Heritage Site. Hluhluwe-imfolozi » 10 minutes after entering Hluhluwe Imfolozi on our first day, we found a lion kill with several spotted hyenas hanging around in the hope of scavenging some scraps. We were also blessed with a cheetah sighting - these cats are not often seen in the park due to their low numbers there. A small reserve in KZN, just south of Swaziland. It is situated in a mountainous area and therefore the scenic beauty is one of its drawing cards. You'll find plenty of plains game (giraffe, zebra, tsessebe, ostriches...) and rhinos not to mention peace and tranquility. And, where else is swimming in a wilderness river permitted? Unfenced accommodation options include a rustic camp site, bush camps, the main camp with thatched chalets and an exclusive lodge. The Addo Elephant Park boasts the densest elephant population on the planet and it's one of the few places in Africa where it's possible to see the big five (elephant, lion, rhino, buffalo, leopard), the southern right whale and the great white shark (the so called big seven). Situated in the far north of South Africa, this reserve is remarkable not only for the fact that it's one of the few malaria free safari areas in Africa but also that it was the scene of one of the largest wildlife translocation operations in the world. Over 8000 animals were reintroduced to this area which was proclaimed a game reserve by the government in 1991 in an effort to uplift the poor in the area and repatriate poorly performing farmland. Now it has become a very sought after if lesser known South Africa safari destination.